To commemorate Guyana’s 50th Anniversary as a Cooperative Republic in the year 2020, the Guyana Gold Board in collaboration with the Ministry of Natural Resources invites the submission of original artistic interpretations of the theme “Continuous Development- Committing to a Green Guyana through Sustainable Mining”. This juried art competition offers 1st, 2nd and 3rd place prizes for original artistic creations; participants must be between 16-35 years of age in order to participate. 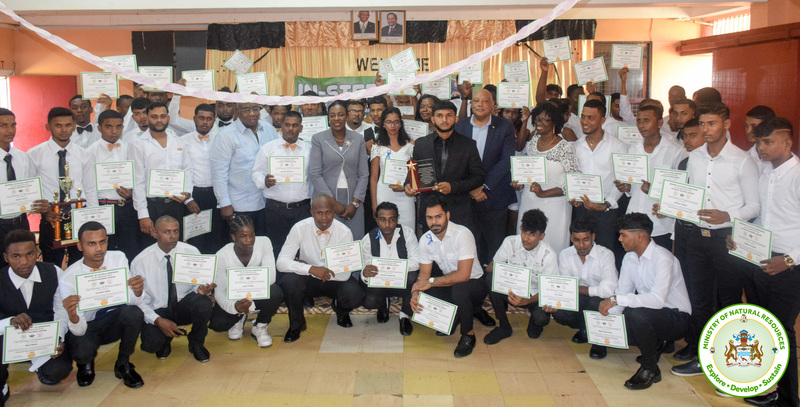 Selected works will be featured on Gold Medallions, produced by the Guyana Gold Board to be made available for sale to the general public and overseas markets by mid 2019. One (1) design must be submitted for the front of the gold medallion. Artwork must be accompanied by a short summary containing no more than 150 words, giving the artist’s interpretation of his/her work. Artwork could be done digitally or hand drawn. Artwork submitted in hardcopy must be no smaller than 8 inches by 12 inches and no larger than 10 inches by 16 inches. Do not mat or frame artwork. Contestants are advised to avoid gradients and half-tones. The artwork must be easy to use and manipulate for all reproduction purposes. The use of lettering or numbering on the artwork, in any language is not allowed. Submit only original artwork that has been created by you, the artist, as identified on the submission form; no part of any artistic rendering that is submitted should be copied or adapted from another source. A maximum of one (1) entry per contestant is allowed for the competition. Submissions: Deadline: 16:00 hrs. on Tuesday, October 16, 2018. 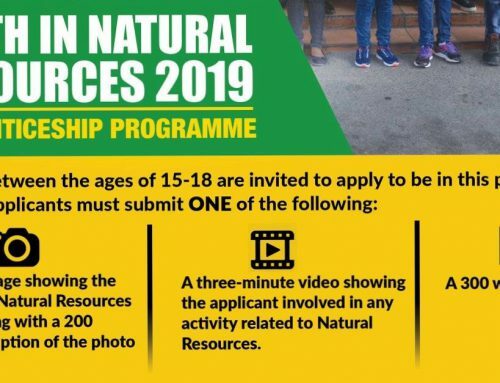 Each entry must be accompanied by an entry form as provided in the print media or on the Ministry of Natural Resources website. Entry Forms must be legibly completed in ink. 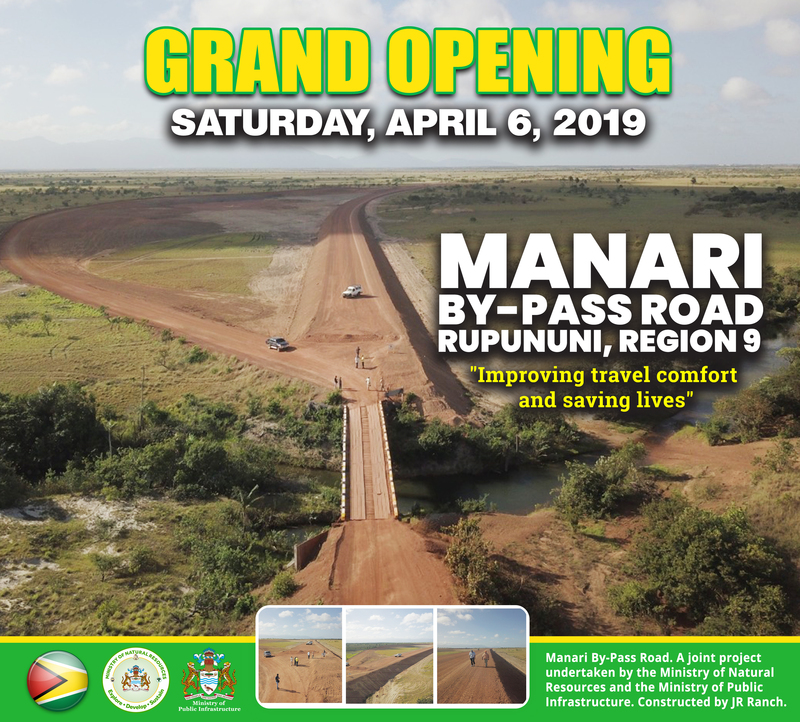 Entrants will be required to provide official proof of their age in the form of a copy of their birth certificate, valid passport or identification card. By participating in the competition, participants accept all competition rules and agree to be bound by them. All entries become the property of the Guyana Gold Board from the date of submission. No entry shall contain any trademark. 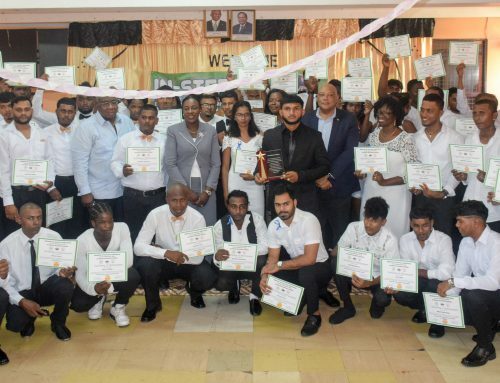 The Guyana Gold Board reserves the right to print, publish, upload and/or display the name, age, photograph and entry of all participants. 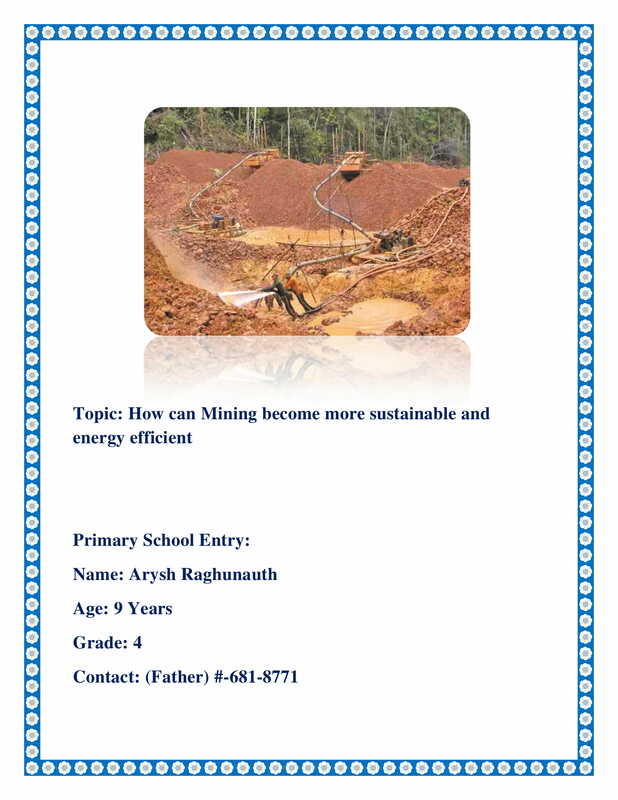 Clarity of the theme “Continuous Development-Committing to a Green Guyana through Sustainable Mining” to the viewer. Overall impression. The effect of the project as a whole, often based on the first glimpse of the finished piece, will be judged. 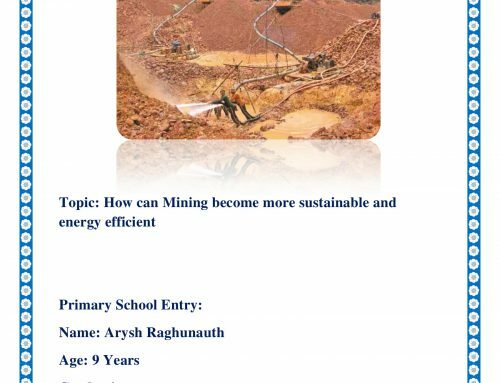 The winning entry will be selected by a panel comprising independent judges and management of the Guyana Gold Board. Their decision will be final and no further correspondence shall be entered into. Winners and Finalists will be contacted by November 7, 2018 and announced by November 22, 2018. All participants under the age of 18 years must seek and provide written permission from their parents or legal guardians before participating in the competition. – The determination of the judges is final, non-reviewable and non-appealable. 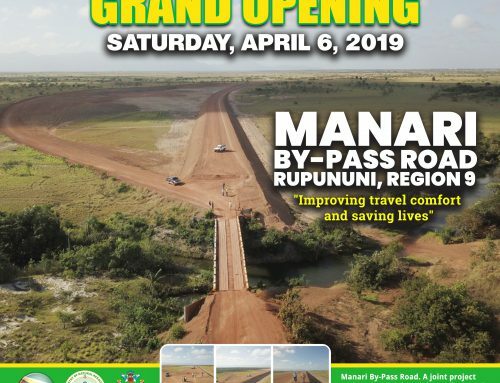 Please note that the art competition is not open to employees of the Guyana Gold Board, Ministry of Natural Resources, selected Judges and their immediate family members. Is not responsible for lost, late, misdirected, incomplete, illegible, or otherwise unusable entries, including entries that are lost or unusable due to computer, internet, or electronic problems. Is not liable, for the purpose of winner and prize notification and delivery, in the event the contest winner has provided incorrect, outdated, or otherwise invalid contact information. Shall have the right to adapt, edit, modify, or otherwise use the winning submissions in part or in its entirety in whatever manner it deems appropriate. Reserves the right to choose not to use the winning entry as described in these contest guidelines.